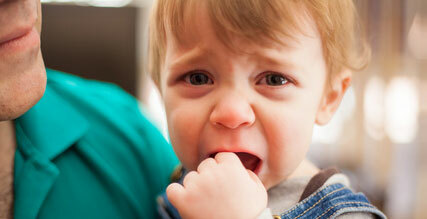 Pregnancy And Baby Care Slideshow How to Handle a Whining Toddler? Kids often whine to get their parents’ attention. Behaviors like crying, kicking or screaming is bound to make their parents react, and this serves to reinforce a child’s belief that she can get the attention she needs in this manner. Snapping or scolding may only cause her to whine in future when she feels frustrated or neglected. It’s a far better approach to correct the child’s behavior in a calm and firm way. Request her to ask for what she needs politely and to refrain from hitting and biting. If she continues whining, announce that you will only listen when she used her normal tone of voice. Discipline assures a child that there are consequences to her actions. If unruly behavior persists, let her know that you will carry out your threat of time-out. Once she is calmer, ask for an apology and follow it up with a hug, so she knows that the discipline is good for her. Just as you react to bad behavior, make it a point to react to good behavior too. If your child resolves a problem without whining, praise her for it and reinforce the message that dealing with frustrating circumstances in a calm way will yield a positive result. Sometimes whining may be related to a deeper issue. Maybe your child is hungry or has outgrown her toys and games. It’s helpful to take note of the situation so you can understand her behavior better. Giving her a snack or taking her to the park may help to relieve her discomfort. A common reason for whining is just plain tiredness. Even with a sleep schedule, there may be times when your child wants to sleep some more. It’s a good time to evaluate if the sleep schedule is satisfying enough for her. Instead of having her adjust to the existing schedule, make a few adjustments so she can get adequate sleep at the appropriate times. Sweets and sugary drinks in excess can cause your child to build up a great deal of hyperactive energy. Once this sugar high diminishes, tiredness and irritability is likely to set in. This is when whining can start. Make a note of your child’s eating habits so you can easily detect a connection between certain foods and behaviors. To prevent bouts of whining while travelling, keep your child engaged with her favorite game or toy. You can even play some fun music in the car. Parents often dread taking their children along to the supermarket for fear of a whining attack. Make this an enjoyable activity for your child and you by keeping her busy with some duties. Ask her to help you look for things on the grocery list. Whining at bedtime is best handled by putting a bedtime routine in place. It could be anything from reading a bedtime story, playing a quiet game or even just chatting a little with your child before putting her to bed. Toddlers are curious by nature and at times may become so engrossed in some activities that they may not want to stop. Pulling them away or demanding they stop what they’re doing at once may lead to frustration and whining. Instead, exercise flexibility and make little compromises with them such as agreeing to read another book with them before bedtime. This helps them understand that it’s far better to reason with you rather than whine.